Is Risk Coming at You Head On? But compared to all of these better known risks, it turns out going to the store or sitting and eating a fast food burger or drinking a cup of $4 coffee can be can be even more dangerous. At least 500 Americans died last year when a vehicle crashed through the doorways, windows, or walls of stores, restaurants, office buildings and strip malls. That’s more fatalities than all of these better known risks combined. Employees, shoppers, customers, and people just entering or leaving through front doors are killed every day when a vehicle leaves the street or parking lot and crashes into a commercial building. As many as 3600 people were injured last year – and the toll keeps rising. 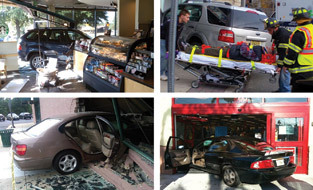 Vehicle-into-building crashes (which we refer to as storefront crashes) occur more than sixty times per day. 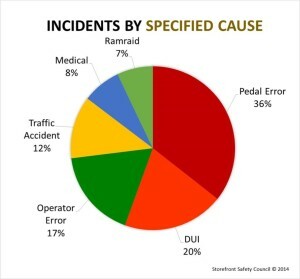 The Storefront Safety Council, working with the Texas Traffic Institute at Texas A&M University, examined hundreds of anecdotal and media reports, court records, and published studies covering thousands of accidents. We determined that such crashes are far more frequent and far more expensive for businesses and insurers than the industry realizes. Most frequently, these types of accidents are the result of some sort of driver error which has been compounded by design factors in parking lots, pedestrian and sidewalk areas, and store layouts. Parking areas with nose-in or head-in parking suffer the majority of these crashes, followed by properties where drive aisles or driveway entrances point vehicles directly at vulnerable areas without benefit of any kind of safety or landscaped barrier. Our research shows that pointing vehicles directly at pedestrians and commercial buildings can be deadly because drivers are prone to making simple errors that can result in tragic consequences – hitting the gas instead of the brake, texting while driving, or simply going too fast. 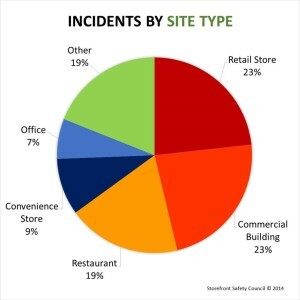 A look at our statistics for the past twelve months tells the story – convenience stores, fast food restaurants, retailers, and offices are most frequently hit, which is a reasonable expectation given how common such buildings are. We estimate that there are as many as 20,000 crashes into commercial buildings every year, with all of the attendant costs of structural damage and repair, loss of income, personal injury claims, and so on. 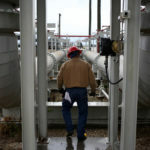 Even the most conservative estimates put the cost per year in the hundreds of millions of dollars. Unfortunately, we see this trend as increasing over at least the next decade. Most of the driver errors we have identified tend become more frequent with age – and the Silver Tsunami of aging Baby Boomers is going to result in more and more drivers aged 70 and above on the road till well past 2025. Add in other factors like distracted driving, increasing tolerance for legalized marijuana use, drivers on prescription medications and the growing number of registered vehicles on the road, and the rate we currently see will certainly be climbing along with the risk factors. 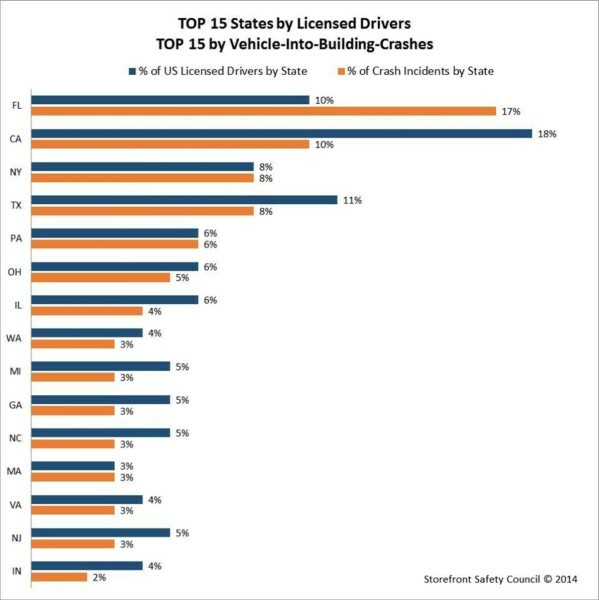 The states with the highest number of licensed drivers also have the highest rates of storefront crashes (see figure 3) But our data suggests that numbers alone are not the whole story. 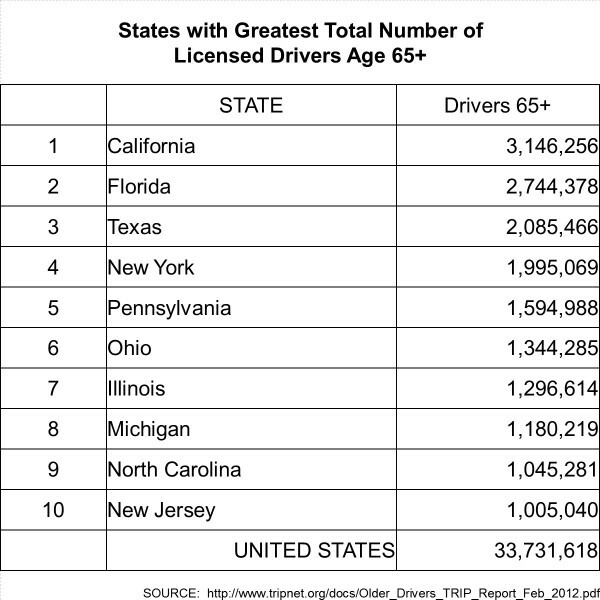 All 10 of the states with the highest number of drivers over 65 also suffer the highest number of storefront crashes (see figure 4) though with some other states making the list as well. All of these storefront crashes, injuries, and fatalities are adding up to a massive premises liability issue for retailers, business owners, and commercial property owners. Once protected in almost every state against “unforeseeable” events, large settlements and payouts for the injured and for survivors are increasingly the rule in many jurisdictions. Recent decisions in Illinois, New Mexico, and California have affirmed that the doctrines of Foreseeability and Duty of Care are matters for juries to decide. A defense which makes the claim that “an accident like this is so rare that it is like getting hit by lightning” is not going to be an effective defense. While this is still evolving as a matter of law, it does seem to be the trend in states that suffer the most from these types of crashes. Awards and settlements vary by case, by circumstance, and by jurisdiction, but one possible trend emerging is linking the real estate owner to the lessor/franchisor/franchisee. For example, coffee and donut Chain X suffers several storefront crashes per week nationally. These are franchised stores, so when an injury crash occurs claims are made on the franchisee. But increasingly, claims are also made on the franchisor because the franchisor has institutional knowledge of the frequency and severity of such crashes across all locations nationally. Property owners leasing to Chain X are also seeing claims when it can be shown that they had institutional knowledge of such crashes at their other properties OR were aware of such crashes at other Chain X locations. Certain cities like Houston and St Louis seem to have more of these than others, and rural areas where law enforcement is spread thinner also have more than their share of such crimes. These are dangerous and very expensive crimes, where often the cost of structural repairs is many times the cost of the cash or merchandise that was stolen. Bollards and barriers are cheap, effective and proven methods to deter deliberate attacks and to prevent unintended incidents from becoming headline grabbing accidents. ASTM International is finalizing a test standard for bollards and barriers suitable for commercial applications which will prevent the majority of storefront crashes. Final committee approval is expected in Fall 2014, with full roll out nationally in Spring 2015 (see ASTM WK13074 HERE) The ASTM standard will give architects, property owners and local officials the tools to specify and install effective measures which will reduce the toll of this under-the-radar problem. Rob Reiter is an expert in perimeter security and retail and pedestrian safety. He is a co-founder of the Storefront Safety Council and has built a unique database of incidents, photographs, and case histories. He consults with companies in the manufacturing, security, and safety industries and serves as an expert witness in cases nationally.